Retelling is a strategy that is used to determine how well a student has comprehended a specific story. Retelling can be used as an effective tool in improving comprehension as well as assessing it (Jennings, Caldwell, & Lerner, 2014, p. 268). During a retelling, teachers gain insight as to how students are putting together the information offered in a text. When students' understanding of a text is observed and analyzed during retelling, teachers discover what information students remember and deem as important. According to Jennings, Caldwell, & Lerner (2014), to begin a retelling, inform the student he or she will retell a story after it is read (p. 268). Then, have the student read the text. After reading, ask the student to tell about the story as if he or she was telling it to someone who had never read it. Once the student has finished retelling the information he or she remembers from the story, you may ask the student to elaborate on certain parts. Jennings, Caldwell, & Lerner (2014) state, "this prompting is important for low-achieving readers, because they often know more about a story than they will tell in a free recall" (p. 268). Referring to all characters as "him," "her," or "they"
According to Jennings, Caldwell, & Lerner (2014), "evidence suggests that students who retell stories improve their comprehension" (p. 269). Students' reading comprehension improves when teachers give feedback about retellings. The video above shows a teacher describing an example of oral retelling of Mercy Watson Thinks Like A Pig using a retell rope. The teacher uses the retell rope to describe the characters, settings, problem, in the beginning, next, then, and finally. The teacher then explains a written retell and shows a completed example for the same story. This written retell involves the same aspects of the story as the oral retell. 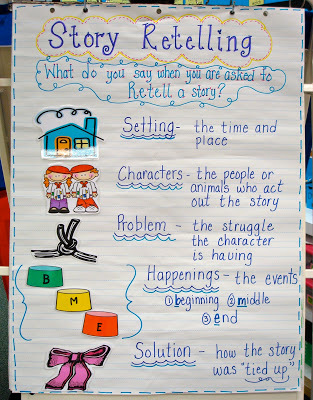 The image above is an example of an anchor chart that could be displayed in the classroom as students learn about retelling stories. It describes what students should say when they are asked to retell a story. This includes describing the setting, characters, problem, happenings (events), and solution. The video above shows a student demonstrating an oral retell of the book If You Give a Pig a Pancake. This student uses a graphic organizer to support this retell. The chart uses the same visuals as the anchor chart on the left to support students' understanding during the retell. As this student retells key details, he is better comprehending the story by describing the setting, characters, problem, events (beginning, middle, end), and solution. Reading- The retelling strategy is often used in reading. Students participate in oral or written retellings after reading a text in order to better comprehend the story elements. In order to do retellings in reading, students can do a picture walk through the story to assist in the retell. Students can also retell a story using props or pictures. The video above shows an example of a teacher using a retell rope to retell the story Mercy Watson Thinks Like A Pig. The retell rope helps students visualize the sequencing of events and other aspects of the story. In written retellings, graphic organizers are often used that ask questions or provide visuals for each story element. Students in primary grades might retell a story using pictures. Math- In math, retelling can be used as a means for students to explain and describe how they were able to solve a given problem. This might involve students in elaborating on each step they took in order to solve the problem and explaining their reasoning for why they performed those steps, including whether or not each step makes sense given the problem at hand. Students' retelling of math procedures should also include when to use the procedure and a definition of this concept or procedure. Retelling can also be used in math in a way that involves students retelling what another student or what the teacher said when it comes to solving a problem. Science- Retelling can be used in science by involving students in describing an observed experiment, or an experiment they performed themselves. Students can retell the steps that were involved in completing the experiment and tell about the hypotheses. This procedure should be described in sequential order that follows a process. Students can describe what the expected outcome was in the experiment and follow up with the result or solution, including whether this result was what was originally expected. Students should also tell about variables of the experiment in the retelling. Social Studies- The retelling strategy can easily be used in social studies as students learn about major events and historical figures. Students can retell what the problem or conflict was in the major event and also describe the solution or result of this event. This might include retelling the "who, what, when, where, and why" about the particular event in history to demonstrate understanding. As students retell major events, it is important to pay attention to how they are sequencing the happenings together in the beginning, middle, and end, and also how they describe the setting of where and when the event took place.